Your kitchen is the center of your home. It’s the hub of activity, the congregation place for your family and most importantly, where you break bread with others close to you. So, when undergoing a kitchen remodel it’s not uncommon for homeowners to explore updates to the surrounding living spaces. One of the easiest and most significant updates that can be made is the color of the walls in the kitchen and the adjoining rooms. 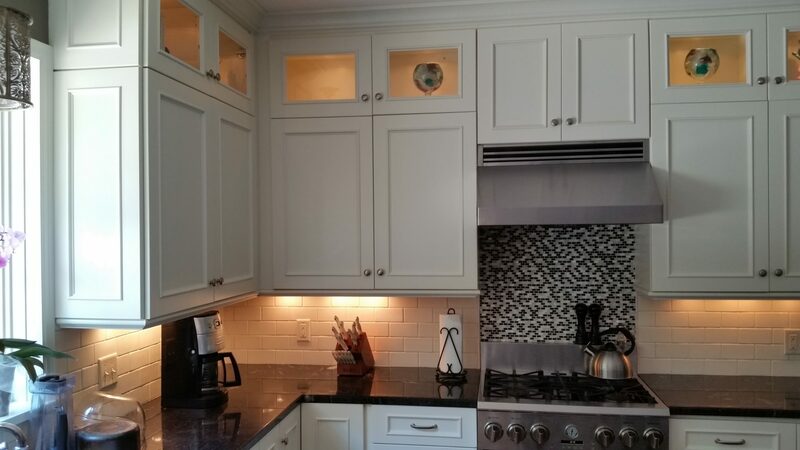 The fact that we selected white cabinets made choosing a paint color simple. However, had we picked out a darker wood or something lighter, like oak, the color for our kitchen would have become a bit more difficult. An interesting aspect of our kitchen are the floor to ceiling windows in the dining area which provided us the flexibility to go a little darker with the color than we might have had our kitchen not had those windows. 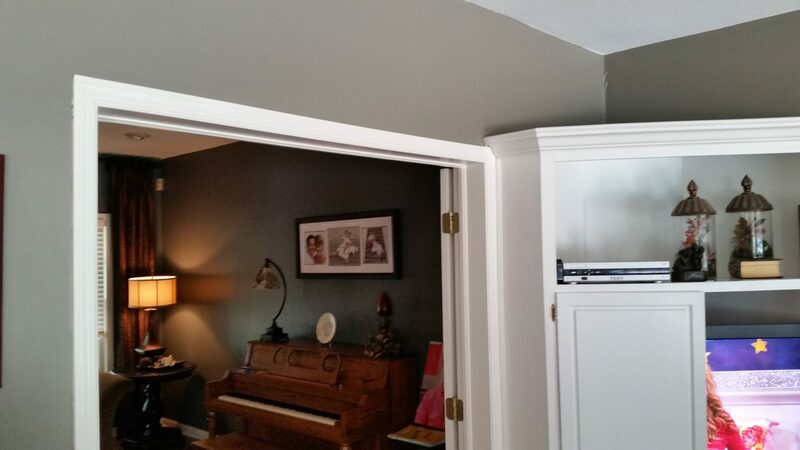 Matched with the white cabinets, we felt a darker color would work well. Adjacent to our kitchen is our dining room, which is connected to our living room! So it made perfect sense to explore a new look for our dining room and living room as well. 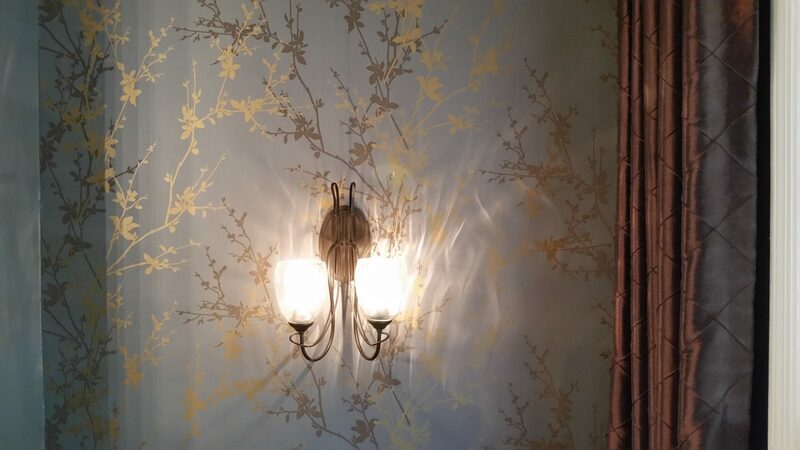 On two of our walls in the dining room we have a wall covering that we’re fond of and didn’t want to replace, so we used these accent walls as a rallying point for the color in these rooms. If you’ve remodeled a kitchen, you realize how expensive this project can be, and updating our furniture and floor covering at the same time was not an option. Instead, we considered the colors we had to work with and did our best to complement our existing assets. This can be tricky because at some point we will replace furniture so we wanted to select colors that work with our existing furniture as well as anything we purchase in the future. Window treatments can be costly and quite dramatic in many homes. Though ours are not dramatic, they were pieces that we wanted to work with rather than replace. Tying all of these pieces together with colors that would elevate the overall aesthetic of our home would have been more than my wife and I could handle, so we consulted a design professional for recommendations. She proposed gray and gray. Yep, same essential color, yet different shades of gray which made me quickly realize that indeed, gray truly is the new beige. At first, I was skeptical thinking that two shades of the same color would never work – that they’d be too similar and make our home look uninteresting and boring. However, once the paint was on the walls it was remarkable the way the colors brought out these key features of our home in ways that I never expected. It was also surprising how dissimilar the colors actually look when positioned close to each other leading me to the following conclusions: if you’re asked to paint, just paint and never doubt a trained professional designer!